lack, light blue, pink, brown, and purple. Title: View of the Catskill Mountain House, Hudson, N.Y. The engraving done in 1831 of the Thomas Cole painting, which is the source print for this, and Catskill House, Hudson. The Evergreen, Vol. VIII, No. 2 (Feb. 1851), p. 33. 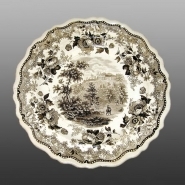 Also shown here is a dinner plate printed in brown. An earthenware plate printed in blue with View of the Catskill Mountain House, N.Y. This is one view of many included in the maker's American Scenery Series. The series is known to have been printed in black, light blue, pink, brown, and purple.